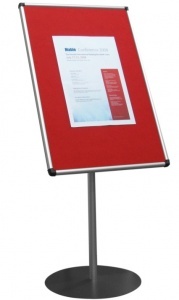 This freestanding notice board is for use in public and foyer areas. 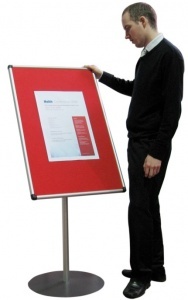 Available in 3 popular sizes the Scribe Freestanding Foyer Notice Board is a durable aluminium framed freestanding notice board designed for internal use. The sturdy aluminium frame has a curved anodised aluminium satin silver finish with nylon corners. 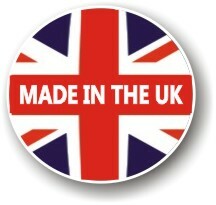 The Loop Nylon Fabric used is available in 5 standard colours and is Fire Retardant to BS 5867 Part 2. The post and base of the Vision freestanding foyer notice board have a powder coated finish.